Discover the Secrets to Throwing the Ultimate Birthday Party and Hear Your Kids Say That Was the Best Birthday Party Ever! Did you know that a fantastic birthday party does not have to cost as much as you think and that same low cost birthday party will put your child in the glowing light and envy of all his or her friends? How, you ask; because you would have read this eBook, Successful Birthday Parties for Kids!. Provide you with party themes of all age groups, games and activities for all age groups, party favor ideas that will impress your childs peers, food ideas that will surprise you, and still more! Still a bit skeptical? That is understandable; you have no clue if what I say is really in this fantastic eBook, however I can guarantee you it is and still so much more! When it comes to planning birthday parties, there is no need to get flustered over all that needs to be done. The organization of it all, the invitations, party theme, decorations, food, gifts, cake, location, and a hoard of other things that need looking after can be a breeze. Successful Birthday Parties for Kids! 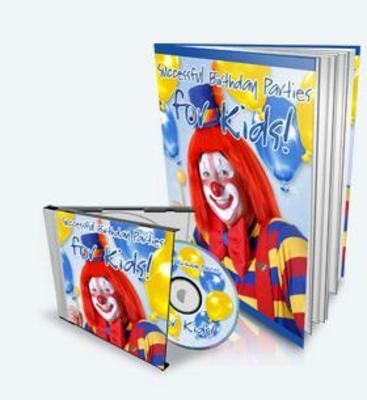 will reveal great knowledge from years of experience that will solve all your kids birthday party dilemmas. It practically does the work for you! Trying not to get lost in the stressors involved can bring on questions like How early should I start planning? or You want to invite how many kids? and the And how exactly do you expect me to pull off that kind of party? dilemmas are all answered and hundreds of more problems solved. You will find concrete answers that work 100 of the time. This guide is not marketed towards the rich or the poor, it is marketed for anyone who wants to be able to throw a fantastic birthday party for their child, not go broke doing so, and make that day the most special day of your childs life. How much is that worth to you? I know; Priceless. 1. How much did you spend to pull off your childs last birthday party factoring in food, decorations, party favors, games, activities, location, and everything else it entails? $300.00, $400.00, $500.00 MORE??? 2. Now, what if you could throw the best birthday party ever for a small fraction of that cost? Would you be interested?